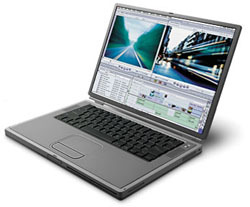 Announced in October 2001, the PowerBook G4 (Gigabit Ethernet) was a speed-bump to the original PowerBook G4. In addition to faster processor speeds, the Powerbook G4 (GE) included a better graphics card, an on-chip L2 cache, and a faster system bus on the high-end model. The PowerBook G4 (Gigabit Ethernet) shipped in two configurations. The 550 MHz model, with 128 MB of RAM and a 20 GB hard drive was $2,199, and the 667 MHz model, with 256 MB of RAM, a 133 MHz system-bus, a 30 GB hard drive and a pre-installed Airport card was $2,999. There was also a 512 MB/48 GB/Airport BTO configuration for $3599. Just a few weeks later, the G4 (Gigabit) was further enhanced, with the inclusion of a CD-R/DVD-ROM "Combo Drive," and twice the ammount of RAM across the entire line.